Fig. 1. 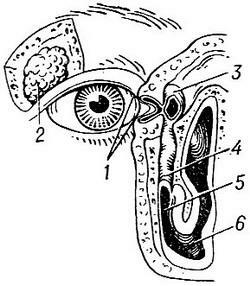 Tear authorities: 1 - lacrimal punctum; 2 - lacrimal gland; 3 - lacrimal SAC; 4 - tears-and-nasal channel; 5-hole of the nasolacrimal duct; 6 - the lower nasal Concha. Tear bodies - system bodies that produce and discharge tears, moisturizing surface of the eyeball and the conjunctiva (Fig. 1). In lacrimal bodies included two divisions: lesoproduktsii and slezootdelenia. The first type includes the lacrimal gland located at the top-the outer part of the orbit. It ductless 4 -5 holes open in the top conjunctival vault. Slezootdelenia system begins with the tear points (top and bottom), which pass in the lachrymal channel, flowing into the lacrimal SAC, located at the inner wall of the orbit. The lacrimal SAC goes into the tear-nasal canal, ending below the lower nasal sink. When viewed tear authorities pay attention to the lacrimal punctum (narrowing, Bamyan), their position (eversion, offset), on the lacrimal SAC area (swelling, fistula). Tear tubule in pathological processes felt in the form of thickened cord (dagriculture). The appearance of discharge when pressed on the lacrimal SAC area is inflammation of the lacrimal SAC (dacryocystitis). Special studies lacrimal ducts include tubular and nasal samples, washing, sensing, medical imaging lacrimal ducts. The most common causes watery eyes are eversion lower tear points, narrowing them wrong position, the narrowing of the lachrymal channel. Treatment is primarily surgical. When dacryocystitis treatment depends on the nature of the process (trahaetsy, fungal, purulent). Inflammation of the lacrimal SAC can be chronic or acute. Chronic dacryocystitis usually develops when narrowing of the nasolacrimal duct. The disease is watering and purulent tear points. Due to the constant infection of the mucous membrane of the eyelids occurs her hyperemia, hard blepharitis (see) and conjunctivitis (see). There is a danger of occurrence of ulcers of the cornea if it is damaged. During long-term inflammatory process lacrimal SAC stretched and will wybuchem under the skin. Next is sometimes closed the entrance of the lachrymal channel, and formed a closed cavity with the mucous content - hydrops of the lacrimal SAC (Fig. 2). Treatment - surgical (see Dacryocystorhinostomy). Acute phlegmonously dacryocystitis usually develops from chronic due to infection from the lacrimal SAC into the surrounding tissue. Treatment in the acute period total (antibiotics, sulfonamides)sometimes make the incision of ulcer. Dacryocystitis newborn develops in cases, when by the moment of birth of a child lower part of the nasolacrimal channel is closed epithelial tube. Treatment - downward massage or careful washing of the lacrimal ducts. Fig. 3. Inflammation of the lacrimal gland. Inflammation of the tear glands (dacryoadenitis, Fig. 3) can be acute or chronic. Acute dacryoadenitis often occurs as a result of endogenous infection (sore throat, influenza, rheumatism). Chronic dacryoadenitis develops from acute or occur on their own. In the latter case is more often tuberculous origin. Treatment of acute dacryoadenitis is the local application of heat, UHF-therapy. Inside antibiotics or sulfonamides. In the formation of an abscess it open. Reflex hyperfunction of the lacrimal gland can cause watery eyes. Hypofunction of the lacrimal gland characterized by a sharp decrease in the allocation of tears. At the same time, patients receive complaints of dryness, itching, burning, foreign body sensation for centuries, photophobia. Affected cornea. Treatment of symptomatic.